Bob (Luigi) Folk died Monday, June 4th, 2018 after surgery at the age of 93. He was in poor health, but was in the office as recently as last week – still investigating geology’s puzzles. Luigi is a legendary figure for the Jackson School of Geosciences, The University of Texas at Austin, and the field of sedimentary geology. It is difficult to believe he is gone. There will be a memorial service for him on Saturday, June 9th at 1 p.m. at the First United Methodist Church (1201 Lavaca St, Austin, TX 78701) and a visitation the night before, Friday June 8th from 6—8 p.m. at the Weed-Corley-Fish South funeral home (2620 South Congress Ave., Austin, Texas 78705). You can read Luigi’s obituaryhere. Luigi has an enormous legacy – both in terms of his research and the countless students he taught and supervised. He formulated the first carbonate-rock classification in the world. His sandstone classification, though modified, still survives. The “orange book” – Petrology of Sedimentary Rocks, used and cherished by so many students, had six printings. His long-standing debate with Earle McBride on deep versus shallow water deposition led them from West Texas to Italy. Memories of Luigi were captured in Folk Tales for his 90th birthday; other information about Luigi and his remarkable career can be found here. For his scientific genius, he was awarded the 2000 Penrose Medal at the Geological Society of America, its highest honor. In 1979 he received the Twenhofel Medal from SEPM (Society for Sedimentary Geology), and in 1990 he received the Sorby Medal from the International Association of Sedimentologists. For his teaching he was awarded the Geology Foundation Outstanding Teacher Award and the Carolyn G. and G. Moses Knebel Distinguished Teaching Award, both from the University of Texas, the Neil Miner Award from the National Association of Geology Teachers (1989), and the Distinguished Educator Medal from the American Association of Petroleum Geologists (1997). 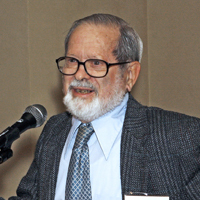 In 2008 he was inducted into the Jackson School of Geosciences Hall of Distinction. Luigi was one of the most creative people I have known. He will be greatly missed. An obituary for Bob can be found here. It is with great sadness to report that AGS member and past president (2009-10) Ann Molineux passed away February 12, 2018. Ann was a fantastic geologist and long-time contributor to AGS field trips among many other geoscientific activities. A truly dynamic, engaging, and lovely person and scientist that will be missed. Click here for a link to a YouTube interview by the UT College of Natural Science titled, "Origins: Ann Molineux. "It is with great sadness I let you know that our colleague, Ann Molineux, passed away yesterday morning. A memorial service will be held later in March so that family and colleagues can travel to Austin. I will send more information as soon as I know more. Her husband Ian has asked that rather than sending flowers, any donations be made to help establish an Ann Molineux Excellence fund for the nonvertebrate collections or to MD Anderson Cancer Center. Ann was Director of Museum Operations and Curator for the Nonvertebrate Paleontology Laboratory at the Pickle Research Campus. For years Ann has made groundbreaking advances in making the collections more accessible to everyone for research, exhibit and education, including bring the collections into the digital age. She was an amazing person and will be greatly missed." Ernie Baker passed away in Austin, Texas on August 20, 2017. After graduating with a degree in geology from the University of Texas at Austin in 1956, he began his career with a 120-day job appointment with the Geologic Division of the USGS. His job was to map a newly discovered uranium deposit in South Texas. After that successful assignment, Ernie obtained a permanent position with the USGS in Texas. Ernie retired in 1992, and then was hired as a retired annuitant. When that position was abolished a few years later, he became a volunteer worker for the USGS. He loved his work and his many friends within the USGS. Although Ernie shunned the limelight, he was surprised on July 28, 2006, with an office celebration of his 50 years of service to the USGS. Along with supplying geologic information and data to many co-workers, Ernie provided responses to the many data and information requests received by the Austin office. His work was always deliberate, thorough, and accurate. It is not an exaggeration to state that he knew more about Texas geology than anybody on the planet. He was a very kind and considerate to everyone and will be missed by all who knew him. Ernie Baker doing field work. By James W. Sansom, Jr., P.G. Publication by Peter T. Flawn avaiable at the Buretau of Economic Geology bookstore. In the early 1960s, I was just beginning my career as a geologist when I first met Dr. Flawn at the Bureau of Economic Geology which was then located on Little Campus. He was a strong and very good leader, outspoken, dedicated to his geological profession, and highly respected by his peers. In 1965 the Austin Geological Society was initiated, and he became the first President of AGS. The first officers were Harold Holloway, Vice-President; Ernest T. Baker, Treasurer; and I was Secretary. Dr. Flawn was a pleasure to work with in getting our new geological society started. An article titled “Austin Geological Society: Early History and Recollections”, co-authored by Sansom and Baker, published in the Austin Geological Society Bulletin, Volume 4, 2008, tells the story of the first years of the society. Click here for the UT-Austin obituary. Click here for the Austin American Statesman article. AGS member Robert Lee Bluntzer, age 83, passed away on December 2, 2016. AGS extends condolences to the Bluntzer family. More information can be found here. In 2006 Bob wrote an AGS Bulletin paper about his work on the water well on the Texas State Capitol grounds. Click here to see the paper. In addition, Bob wrote some important reports on groundwater resources while at the Texas Water Development Board, including TWDB Report 339: Evaluation of Ground-Water Resources of the Paleozoic and Cretaceous Aquifers in the Hill Country of Central Texas. Bob Bluntzer, P.G. was a member of the Austin Geological Society for many years and during that time was an officer and participated in society meetings and field trips. We have known each other since our days in Geology School at University of Texas at Austin and later worked for the Texas Water Development Board. Since our retirement from the State of Texas, we worked together as Consulting Geologist on several geologic projects in Central Texas. Bob gave me a copy of the Travel Guide of a West Texas Trip to Big Bend National Park and McDonald Observatory that he prepared in 2006 for the UT QUEST Organization that he and his wife, Jo, participated in for many years. His daughter, Alice Ley, and son, Peter Bluntzer, as well as, UT QUEST approved and encouraged making this Travel Guide available to those who wish to download it. Bob’s research of geology, water resources, and history of the towns and counties along the route are worthy of being shared with others. James W. Sansom, Jr., P.G. AGS member William Rader passed away July 23, 2016. AGS extends condolences to the Rader family and also to his son and AGS member Bill Rader. Click here for more information.